Asbestos lung cancer is a rare type of lung cancer that accounts for about 4 percent of all U.S. lung cancer fatalities. But asbestos exposure can play a pivotal role in the development of America’s deadliest cancer. But you don’t have to smoke to get lung cancer. While rare, it is important to know some key facts about asbestos lung cancer, including how it compares to cancers linked to smoking as well as other asbestos-related diseases. 1. How Does Asbestos Lung Cancer Develop? 2. What Occupations Are Linked to Asbestos Lung Cancer? 3. What’s the Latency Period of Asbestos Lung Cancer? Asbestos lung cancer typically has a longer latency period compared to lung cancer primarily linked to smoking. It can take up to 35 years after initial asbestos exposure before the onset of asbestos lung cancer. Typically, it takes at least 10 years, at a minimum, to develop, but studies show most development occurs between 30 and 35 years. 4. Are All Asbestos Lung Cancers the Same? No. There are two primary forms of asbestos lung cancer. Small cell lung cancer (SCLC) typically originates in the bronchi near the center of the chest. Non-small cell lung cancer (NSCLC) is the most common type of all lung cancers, making up 80 percent of all cases. SCLC is more aggressive and more difficult to treat than NSCLC. Also, NSCLC comes in three primary subtypes. Adenocarcinoma is the most common of the subtypes among nonsmokers. 5. 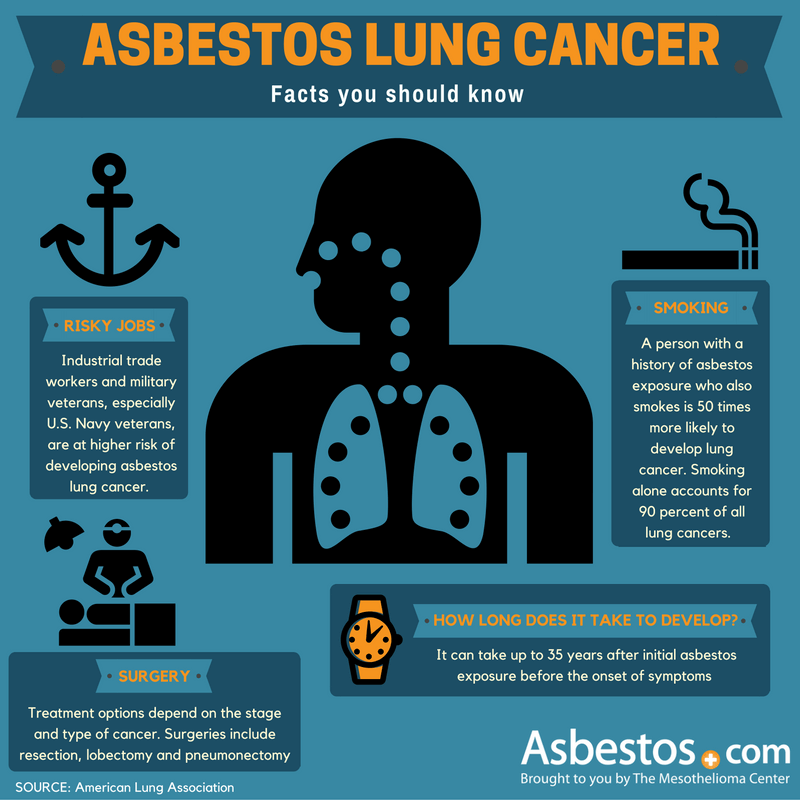 How Is Asbestos Lung Cancer Diagnosed? 6. What Are the Common Symptoms? 7. What Is the Survival Rate? The prognosis, or expected outcome for asbestos lung cancer, is fairly consistent with other types of lung cancer. But this can be difficult to pinpoint in patients with multiple potential causes, which is often the case. Prognosis depends on several factors, including stage of the cancer, age and overall health, but the average prognosis for asbestos lung cancer is about 16 months. 8. What Treatment Options Are Available? Like prognosis, treatment depends on multiple factors, mainly the stage and the type (small cell or non-small cell) of the cancer. Potential curative treatments like surgery are usually possible for early stages before the cancer has spread, while common palliative treatments like radiation therapy make symptoms more bearable while improving outlook for patients in later stages. 9. How Does Smoking or Other Factors Play a Role? Combining smoking and asbestos exposure can increase a person’s chance of developing an asbestos-related disease up to 90 percent. Asbestos and smoking work together synergistically. Both expose our lungs to dangerous carcinogens. Inhaling harmful chemicals from cigarette smoke can have a greater impact on lungs already damaged from asbestos exposure. 10. Is Mesothelioma a Type of Lung Cancer? If you have a history of asbestos exposure and symptoms, such as trouble breathing, coughing or chest pain, consult a doctor immediately. While avoiding asbestos exposure can prove to be more difficult, caution should be taken to avoid unnecessary asbestos exposure.